A new website launched by scientists determined to revive Atlantic salmon stocks is detailing fish counts in the Miramichi River thanks to their network of underwater sonar cameras. Researchers with the Canadian Rivers Institute at the University of New Brunswick are leading the research project for the Collaboration for Atlantic Salmon Tomorrow (CAST), a partnership of scientists, environmental groups and industry participants focused on saving wild Atlantic salmon. The sonars were installed earlier this year in two locations: in Main Southwest Miramichi River at Blackville, N.B. and in the Little Southwest Miramichi River at Upper Oxbow, N.B. The cameras for this research have been funded by J.D. Irving, Limited, part of the company’s investment of more than $25 million in forest research since 1982. 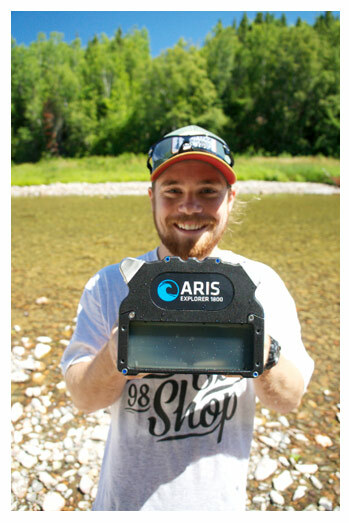 The ultimate goal of the research effort – dubbed the Adaptive Resolution Imaging Sonar, or ARIS, project – is to implement a fully automated tally of Atlantic salmon in the river to inform management of the stocks. The daily count, found at CastSalmon.com, is based on human review of the sonar data collected. But the researchers are working to devise a way for computer analysis of the images to generate the counts. “One huge advantage to the sonar technique is prospect of automating salmon counts. Having people out on the river counting salmon 24 hours a day, seven days a week is not practical,” says Andrew Willett, executive director of CAST. “Can you imagine what it will mean if we can automate the counts and get a robust and accurate picture of Atlantic salmon stocks? That will certainly help efforts to manage stocks on the Miramichi and, we hope, aid in a revival,” Mr. Willett says. Wild Atlantic salmon populations have experienced an accelerated decline since the 1980s in North America. Without immediate action, the population may not be able to recover. Today, only 60 per cent of the conservation requirement is being met. The scientists working on this project are challenged to find a method to ensure that other species of fish are not included in tallies collected from the sonar images. “Sonar is used for counting fish in various rivers around the world. However, the number of different species in the Miramichi River makes the process more difficult compared to many other rivers,” says Dr. Linnansaari. Jani Helminen, a PhD student at UNB involved in the project, says there are many clues in the images that can help distinguish salmon from other fish but there is still work to be done. As part of the project, the researchers are collecting data of movements of different fish species in the river system. Everyone can now participate in the research by reporting the time and location of fish catches on the Miramichi through the website. All fish catches, and especially species other than salmon, are of interest. If the species is not known, a photo can be submitted for identification. “The numbers detailed on the new website represent the current knowledge of fish movements in the Miramichi River and indicate seasonal changes of fish movements. Although the information is a huge step to better population assessment in Miramichi River, there is still some uncertainty in the numbers and we are working hard to improve the accuracy,” says Dr. Linnansaari. The research will continue for the next three years with the goal that sonar can be fully trusted method for counting salmon in the Miramichi River by 2020. CAST (Collaboration for Atlantic Salmon Tomorrow) is a partnership of scientists, environmental groups, industry and government. The focus on on saving Atlantic Salmon before it is too late. Today, CAST is working on Phase One which includes four scientific projects on the Miramichi River. It is hoped that CAST will serve as a positive partnership model for Eastern Canada’s wild Atlantic salmon rivers. CAST partners include the Government of Canada, the Province of New Brunswick, the University of New Brunswick, the Canadian Rivers Institute, the Miramichi Salmon Association, Cooke Aquaculture and J.D. Irving, Limited. The Canadian Rivers Institute (CRI) was founded in 2001 as a collaboration of researchers at the University of New Brunswick at both the Fredericton and Saint John campuses to develop the aquatic science needed to understand, protect, and sustain water resources for the region, nation, and the planet. Today, CRI has grown into a collaborative of hundreds of research associates, graduate students, and staff based at institutions across Canada and internationally working towards the vision of “making every river a healthy river."